Raspberry Pi Zero users looking for an easy way to add additional USB ports to the compact Pi Zero pocket mini PC, while trying to keep the smallest form factor possible. 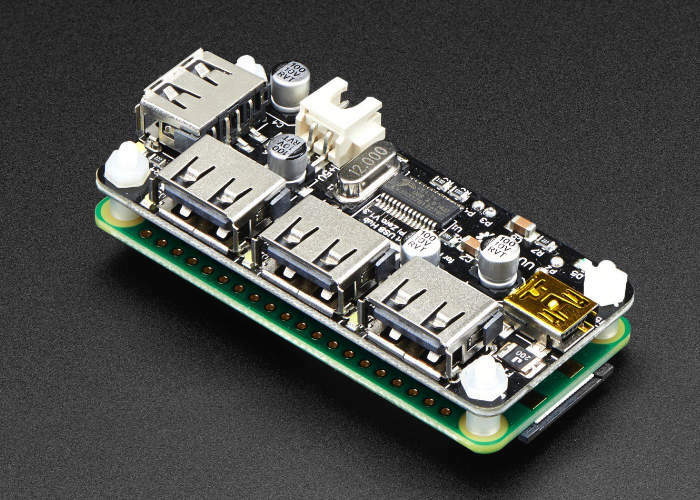 May be interested in a new product which is now available from the Adafruit online store and takes the form of the Zero4U, a 4 Port USB Hub which has been specifically designed for use with the tiny Raspberry Pi Zero and is available to purchase for $9.95. Adafruit explains a little more about what you can expect from this compact USB hub, which conveniently attaches itself to the top of your Raspberry Pi Zero. This is a 4-port USB hub for Raspberry Pi Zero, and it can be mounted back-to-back onto a Pi Zero. The 4 pogo pins on the back will connect the PP1, PP6, PP22 and PP23 testing pads on your Raspberry Pi Zero – no soldering required! The USB hub will take power directly from your Pi Zero, so you don’t need to power the USB hub separately. However you can use the JST XH2.54 connector on board as an alternative power input port. The blue onboard LED is the power indicator, and will light up when power is connected. Each USB port uses a dedicated white LED as a transaction indicator, and a dedicated electrolytic capacitor to help stabilize the output voltage.